2005; 480 pages. Genre : Dystopian Sci-Fi. Overall Rating : B. The plot is easy to summarize : The Orwellian Big-Brother types (the "Tabula") are trying to exterminate the Dimension-Hoppers (the "Travelers"), who are protected by Highlander-type Ninjas (the "Harlequins"). Actually, the Tabula have pretty much won already. There are only 3-4 Harlequins left alive, so we follow one of them - a young, beautiful Ninja babe named Maya - as she tries to keep two sons of a Traveler alive long enough to determine whether they inherited the gift. There's lots of action; there's decent character development; and there's some nasty mutant killer-animals called "splicers". There are some good points about how thoroughly we are monitored nowadays (surveillence cameras, credit cards, and hey, even library cards), and it is interesting to see what steps Maya takes to avoid detection. Although the bad guys are pure evil, Maya isn't your perfect Mary-Sue. And of course, there's dimension-travel. Twelve Hawks apparently uses a Buddhist model for this. There are six dimensions here - Gods, Demi-Gods, Humans, Animals, Hungry Ghosts, and Hell. The storyline is fairly obvious. It turns out this is Book One of an intended trilogy, and I can pretty much tell you how the relationship between Maya and the two brothers is going to end. BTW, Book 3 isn't out yet, and Book 2 is reportedly lots of action and no plot-advancement, so my fear is that Twelve Hawks is setting this up to be more than a trilogy. Considering it's a central point in the book, there's not a lot of dimension-traveling here. The only other plane that is visited is the "Hungry Ghost" one, and that world is given only shallow treatment. 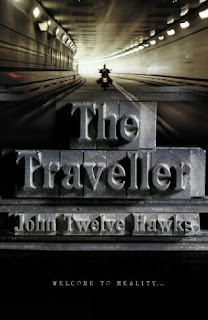 Twelve Hawks is a pseudonym, and apparently there is much speculation as to his/her identity. This seems like publisher's hype, or maybe J12H just doesn't want to do the endless promotional stuff that goes with hawking one's novels. No matter. The story may be compelling, but the writing itself feels high-schoolish. Like something James Patterson would pen. And that's not a compliment. I watched a commercial yesterday - by Duracell, I think. Mother and child are at the park, when Mom suddenly realizes that Junior isn't around. She panics, then realizes that she's got a GPS locator, powered of course by a Duracell battery. She presses the button, the GPS gives her the location of Junior, and there's a happy ending as she goes to the indicated place and finds him. I wonder if there was a subtler message being given in that commercial. The GPS thingy (IIRC) hung around Junior's neck. But we already implant GPS microchips in pets, and I predict it won't be long before a movement is made to do the same to/for our kids. The premise will be that if someone snatches him/her, they can be traced and rescued. The kidnappers can easily detect and dispose of a GPS worn around the neck. But locating it under the skin - not so easy. That sure sounds parentally praiseworthy, but the flipside is that any child with an implanted locator can then be monitored and tracked for the rest of his life by anyone with access to the GPS signal. Like the parents. Or the government. Or one's employer. Which leads to the question - how much privacy are we willing to forego in order to have more security? And in the end, do we really gain any more security at all? But I digress. The Traveler is a decent book, and beyond the story itself, gives us some chilling insight into how easily we could find ourselves in a world where we are constantly monitored. However, it won't be displacing Brave New World or 1984 when it comes to the standard in dystopian novels. It held my attention okay, but when I saw Book 2 (The Dark River) at the used-bookstore yesterday, I didn't have any great urge to buy it.